I'll be perfectly honest, I think personalised presents can be perfect or well, tacky. It's a fine line to walk, but when I first saw Merci Maman I knew that their jewellery fell firmly on the right side for me. I came to know them through the Easter Carnlival event, where I won a voucher that they had kindly donated. 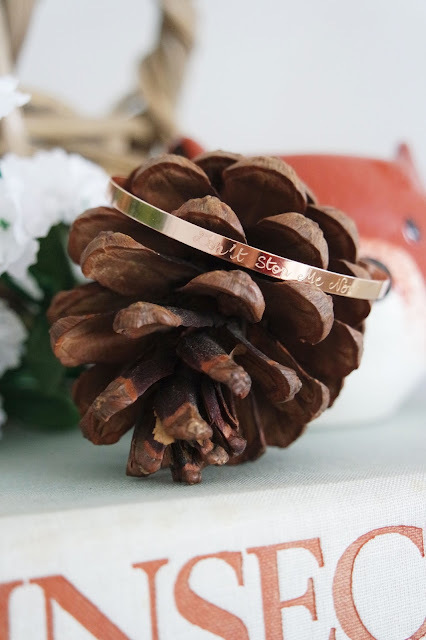 I hopped on to the site and loved looking through their gemstone necklaces, Liberty print bracelets, and dainty rings, but ultimately had my heart set on a simple personalised flat bangle that would look very understated and chic, but mean a lot to me. All of the items are hand engraved in a clear but decorative font, and range from fitting just a single initial to a favourite phrase. After almost a year of choosing the perfect quote, I decided on 'Don't stop me now'. For me, it's a nod to my precious Freddie Mercury and a reminder to have some of his sass, and almost an amulet against anxiety, warning it not to stop me have fun. Who knew a bangle could be so deep, huh? I'll just tell someone it's my favourite song if they ask me in person! 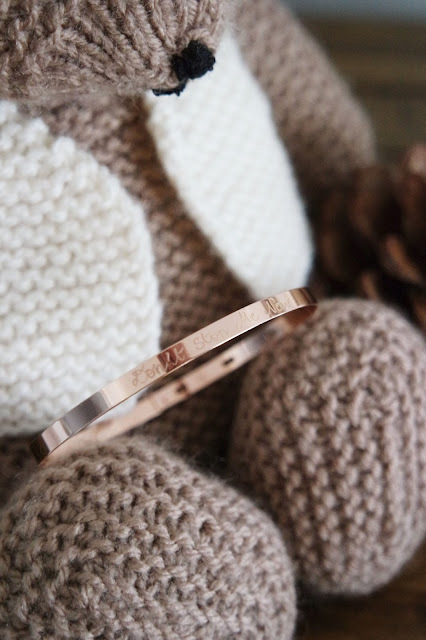 The bangle is available in yellow gold or silver, but obviously I had to choose 18ct plated rose gold. At the checkout I was pleased to find free delivery (always a bonus) plus the option to choose a free gift box, which was a lovely touch because these items really are made for gifting, whether to yourself or someone else. They're beautiful, bespoke pieces that deserve all the bells and whistles. My bangle arrived really quickly but this is where my high opinion faltered slightly. Upon opening the box and trying the bangle on, I was pretty disappointed to find that it is very thin. I had hoped to wear this piece every day, but now I will save it for special occasions because I worry that any bumps will bend it out of shape. Since the metal is so delicate, the engraving is etched on the very top layer, and will fade out with frequent wear. It definitely looks how I had hoped, dainty and chic, and I really love that is has a secure fastening, unlike other bangles which hang open. The fastening is also adjustable, making this a great gift choice for a young person to treasure and wear as they grow. My bangle isn't exactly what I expected, and I feel that the £39 price tag is covering more of the sentimental and unique value rather than the quality of the physical item. However, I feel like this is the exception to the other items Merci Maman stock. Their open bangle, for example, looks much thicker, as do the tags and charms on their other items, and I'm not put off shopping there again. Merci Maman is definitely a boutique I will return to, as I've seen their lines expand to suit all tastes, and their feminine jewellery really does make for special gifts. There are clean cut classic shapes, modern geometric designs, and more rustic hammered metals, all hung on dainty chains, floral fabrics, braided ropes, or leather thongs. In addition to lettering and initials, many of their pieces are made to feel more personal with charms to represent children or partners, and even gemstones to symbolise certain moods. 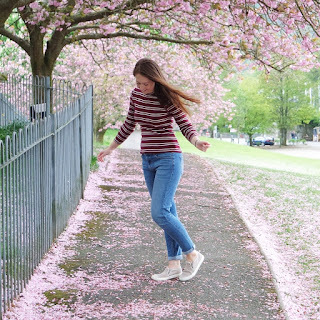 What's on your Merci Maman wishlist?